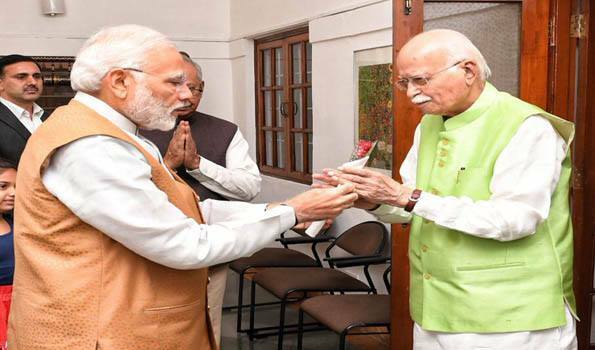 New Delhi: Prime Minister Narendra Modi on Thursday met BJP patriarch and former deputy prime minister L K Advani at his residence here and wished the veteran leader on his 91th birthday. "Went to Advani Ji's residence and wished him on his birthday," Prime Minister tweeted with the photograph of him and the veteran leader. "Shri L K Advaniji's impact on Indian politics is immense. Selflessly and diligently, he built the BJP and wonderfully mentored Karyakartas (workers)," Mr Modi wrote. In a series of messages in the micro blogging site, Mr Modi further wrote: "I pray for the good health and long life of our beloved Advaniji". "Best wishes to Shri L K Advaniji on his birthday. Advani Ji's contribution towards India's development is monumental. His ministerial tenures are applauded for futuristic decision making and people-friendly policies. His wisdom is admired across the political spectrum," Prime Minister said. Born November 8, 1927, Mr Advani began his political life as a RSS worker and has held key positions including Deputy Prime Minister from 2002 to 2004 under Atal Bihari Vajpayee. Mr Advani also served as Minister of Home Affairs between 1998 and 2004. The co-founder of the BJP, he was also the Leader of the Opposition in the 10th Lok Sabha and 14th Lok Sabha.